i've just bought this guitar from the french luthier Gérard Beuzon. The VA is in good condition , in his original case (wtih the sticker 'support your local musician' still on it) , fret protection sheet is ok, original VA certificate of unlimited waranty , two straplocks. 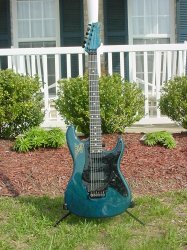 The Floyd rose is made by Schaller (not Kahler) ; it's original , engraved 'valley arts ' on the upper corner. The golden finish has disappeared from some surfaces ( tremolo arm, floyd rose) . As I changed the strings , I've changed the 9V battery too (the EMG were still working, no loss of power); the 9V battery inside was stamped 'april 2001'.